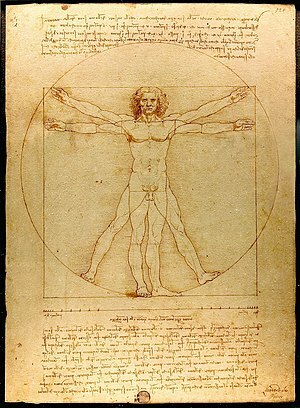 The Vitruvian Man, Italian: Le proporzioni del corpo umano secondo Vitruvio or simply L'Uomo Vitruviano [ˈlwɔːmo vitruˈvjaːno], is a drawin bi Leonardo da Vinci aroond 1490. It is accompanied bi notes based on the wirk o the airchitect Vitruvius. The drawin, which is in pen an ink on paper, depicts a man in twa superimposed poseetions wi his airms an legs apairt and inscribed in a circle an squerr. This page wis last eeditit on 28 November 2015, at 21:25.